What can you do when you forget passcode and get locked out of your iPad? Or your screen is broken and you cannot enter the passcode and access the data on your iPad? This situation can be quite annoying but you can take some actions to rescue the situation. Read on the article to find out how to back up iPad without passcode. Step 1: Run iTunes and connect the locked iPad via an USB cable. Step 2: Click on the device icon at the top and under the "Backups" section, select "This computer" and make sure that "Encrypt iPhone Backup" is unchecked. Then you will create a backup that doesn't include account information or password. Step 3: Click on "Back Up Now" and wait for the process to be finished. Step 4: Once the backup has been created, you can erase the locked iPad including the passcode. While still connected to the computer and on iTunes, click on "Restore iPad." Step 5: If you see a pop-up asking you to back up the device, choose "Don't Backup." Step 6: Once the iPad has been restored, set it up as new and when you reach the "Apps & Data" screen choose "Restore from iTunes Backup." 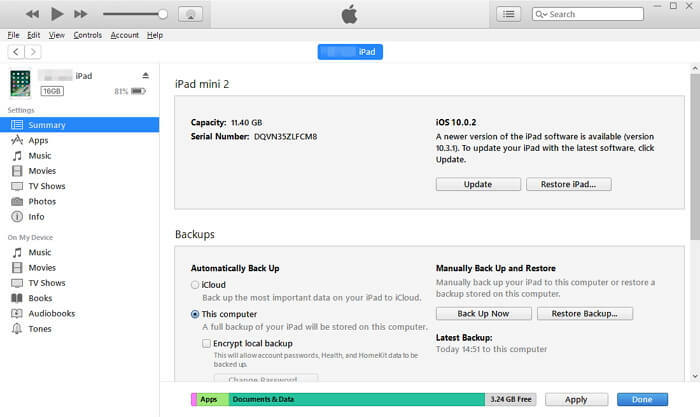 Select the new-created backup and wait for the iPad to be restored. When you compelete all the process, the device will have all your information except the passcode and the iPad should be unlocked. Like what I mentioned above, the first way won't work if you haven't synced with your iPad with iTunes. However, you have an option to extract iPad data if you have backed up the iPad to iTunes before. What you need is just a third-party tool namediMyFone D-Port iTunes Backup Extractor. This software can be helpful when you can't access your locked iPad and you need to extract your data from iTunes backup to computer. Besides, iMyFone D-Port can do much more for you. See its excellent features. It extracts types of files from iTunes backup to computer for more use, for example you can extract notes from iPhone backups, access voice memos in iTunes, etc. Not only iTunes backup, the program can extract data from iCloud backup. It is compatible with latest iOS 11 and iPhone X/iPhone 8. 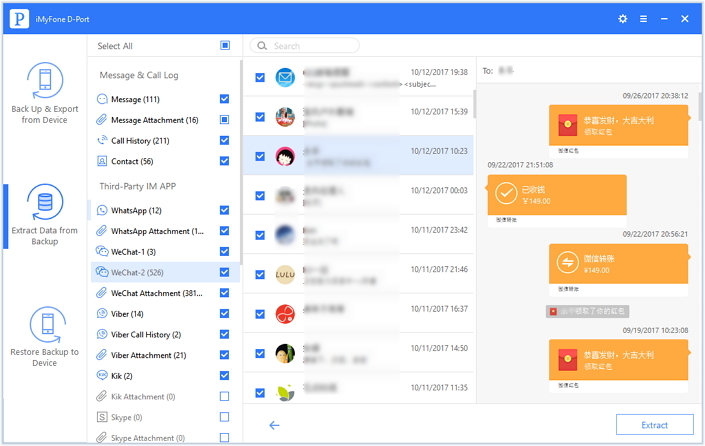 Free trial version, which offers lots of benefits, is offered for both Windows and Mac users to preview data. 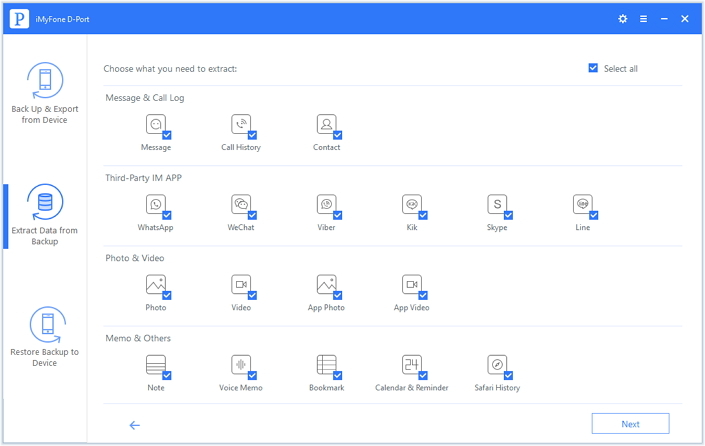 After downloading the program from iMyFone official download center, you can install and launch it to start the process of data extraction. Step 1: From the main window, choose "Extract Data from Backup" and you will see all the backups on your computer. Choose the iTunes backup you need to extract data from and click "Next". Step 2. On the next window select the exact file types you want to extract from iTunes backup. You can choose certain type of data or all the types. Step 3: Click on "Next", the program will start to scan the iTunes backup. After scanning, view them on details and select the relevant ones to "Extract". Step 4: The program will ask you to choose/create a folder on your computer to store the files. Do as the program prompts and you will finishthe process in seconds. It can back up all the data and settings on iPhone like what iTunes can do. But unlike iTunes, the backups it makes won't overwrite old backups on computer. You can selectively back up data on your iPhone, for example, you can back up only WhatsApp messages on iPhone X/iPhone 8, which iTunes and iCloud cannot do. 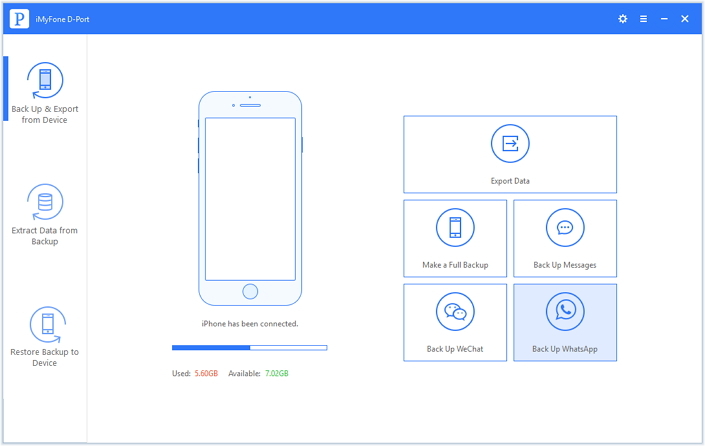 With the Pro version of iMyFone D-Port, you can selectively restore backup to your iOS device without affecting other data. 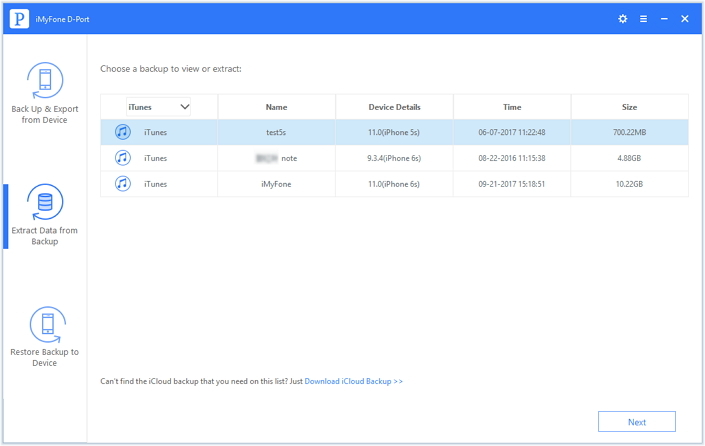 Again, the backup function of iMyFone D-Port is totally Free. 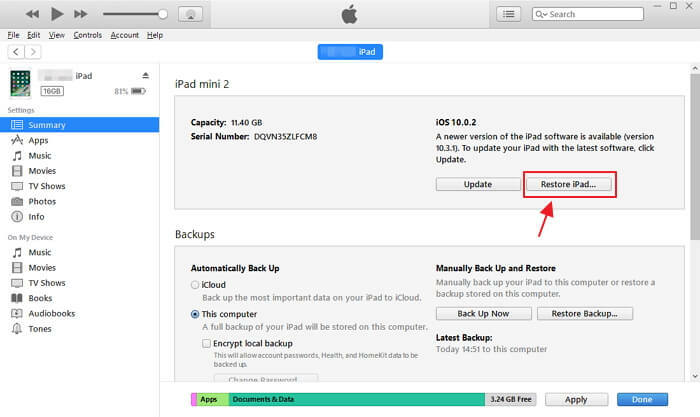 How to Selectively Back Up iPad? If your iPad runs normally, you can back up your iPad entirely or back up only WhatsApp, WeChat, and messages on your iPad. See how to do that. Before start, you should run iMyFone D-Port on your computer and connect your iPad with it. After the prorgam detecting your iPad, click Back Up & Export from Device to choose what you need to back up. As you can see, you can choose Make a Full Backup to back up your device completely, or back up only certain data type. Their process are almost same. 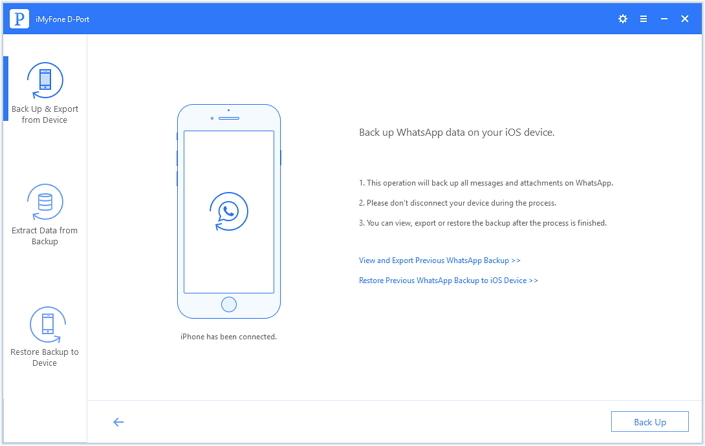 Here we take backing up WhatsApp as example. D-Port Pro will show you the matters you need notice before starting the backup, for example you should keep the connection between your iPad and D-Port during the process. If you confirm, click Back Up to continue. Then D-Port will start to back up all WhatsApp data on your iPad. 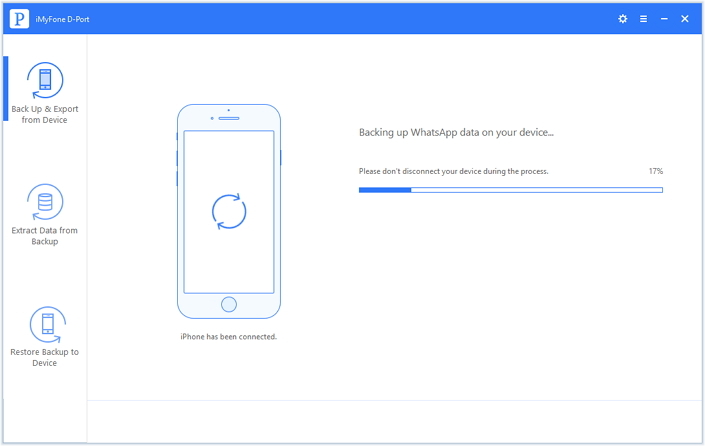 Just wait for several minutes, you can have a seperate backup for all WhatsApp data on your iPad..
Now you know the ways to back up iPad and extract data from iTunes when you are without passcode for your device. Both of them are pretty easy to operate, right? And don't forget that reliable iMyFone D-Port iTunes Backup Extractor offers free trial version for users! How to Save Text Messages from iPhone to PC for Free?